Ana Marie Cox, AB’94, talks with David Axelrod, AB’76, director of the University’s Institute of Politics. 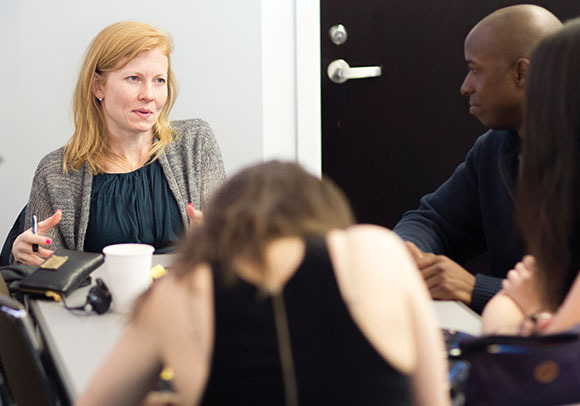 Ana Marie Cox, AB’94, founder of the politics blog Wonkette, was a fellow at the Institute of Politics in 2014. A regular contributor to the New York Times Magazine, she famously asked Bernie Sanders, AB’64, about his hair. 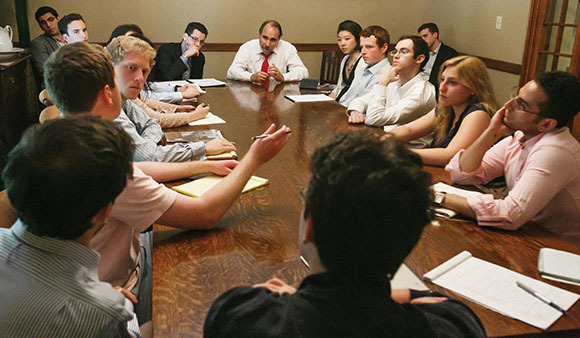 Former political strategist and White House senior adviser David Axelrod, AB’76 (nickname: Axe), has served as director of the University’s Institute of Politics since 2013. The interview below has been edited and adapted. Was there a reason that you chose U of C for undergrad? There were three reasons why. One was I knew it was an excellent university. The second was that it was more than 600 miles from New York City, so I knew my parents wouldn’t surprise me with a visit. And the third was that it was located in a city, a city with very rich politics. Now, that’s a really interesting reason to go there. It turned out to be a stupid reason to go there because there wasn’t a whole lot of interest on campus at the time, at least among the scholars, in Chicago politics. I like to joke that there’s very little interest in talking about anything that happened after the year 1800. And so that’s why I became a journalist, because I needed an outlet for my interest in politics. Chicago has a very lively political atmosphere. At that time, Richard J. Daley was alive—the last of the big city bosses. They had just had this calamitous Democratic convention that was a historical moment. And there was this budding black independent political movement. It was a fascinating place. The University has struggled with how to best use the city. It did exist as a sort of island for a while. Yes, but I have to say that when I was considering where I wanted to put the Institute of Politics, I talked to Northwestern and the University of Chicago. And in my review, I was really pleased to see how much the University has changed since the years when I was here. It’s still, obviously, a stellar institution, with great scholarship, but it’s much more outward facing than it was when I was a student here. And the fact that they opened their arms to the Institute of Politics is a reflection of that. I wish that someone had started an Institute of Politics at the University of Chicago 40 years ago. I would have been a much happier student. I often describe my time at the U of C as the best and worst. An incredible intellectual adventure, but I was pretty miserable. What was your experience? I had some classes that were stimulating, but it was a difficult time for me because I was 17 when I got here, and I really wasn’t a great scholar. Clearly it provided an intellectual foundation. By my second year I was well into preparing myself for a career in journalism, which was not something that you would learn about at the University of Chicago. I was writing for the Hyde Park Herald, stringing for Time magazine and the Washington Post, and traveling the city, absorbing the sort of Byzantine history of Chicago politics. I have great friendships from that time, but most of my memories took place outside of the classroom rather than inside the classroom, which probably doesn’t qualify me to be in the alumni magazine. U of C, in many ways, was my journalism school. The way I was taught to think about problems, to question. Yes, I think that that’s true. There was always rigorous investigation, rigorous debate. To be a good journalist, the best thing you can do is have intellectual curiosity, broad awareness of lots of things, and interest in lots of things. I think that’s far better than going to a journalism school. But you also have to learn how to be a reporter, and that requires doing it. In retrospect I feel like I cheated myself because I was so absorbed in my journalism that I didn’t give enough of myself to my courses. President Obama taught at the Law School. Do you think that there is a University of Chicago imprint on his personality? I think he enjoyed it. It was a perfect place for him because he’s got an elegant mind. Is there going to be an interplay between the IOP and the presidential library? He and I have talked about that in the past. We’ll bring people who are of interest there. He’ll bring people who are of interest to us. His vision is not just of a monument to his career. His vision is of an active, lively, forward-looking center that encourages engagement, empowerment of people to bring about change. So, in some ways, the mission of the Obama center is very consonant with the mission of the IOP. There are going to be natural synergies between us. And having a presidential library and archive doesn’t mean all the scholarship will be positive. Yeah, I’m really eager for people to be trawling through my presidential records. We’re starting to see a resurgence of politically correct culture on campuses. Students seem to confuse sensitivity with active denigration. You want to engage students who care about the values of the institution, who care about the diversity of views and experiences of the people who are teaching. What you don’t want is to shut off the potential for differing points of view, to sort of brand some points of view as unworthy or illegitimate so that you’re not even exposed to it. As far as the Institute of Politics goes, I always want it to be a safe place for all kinds of views and speech, and a place where we can play out those debates in a way that’s respectful. Our students can handle anything, and the best way to defeat a bad idea is to talk about it.